It may be over a year later, but there is more story to share! 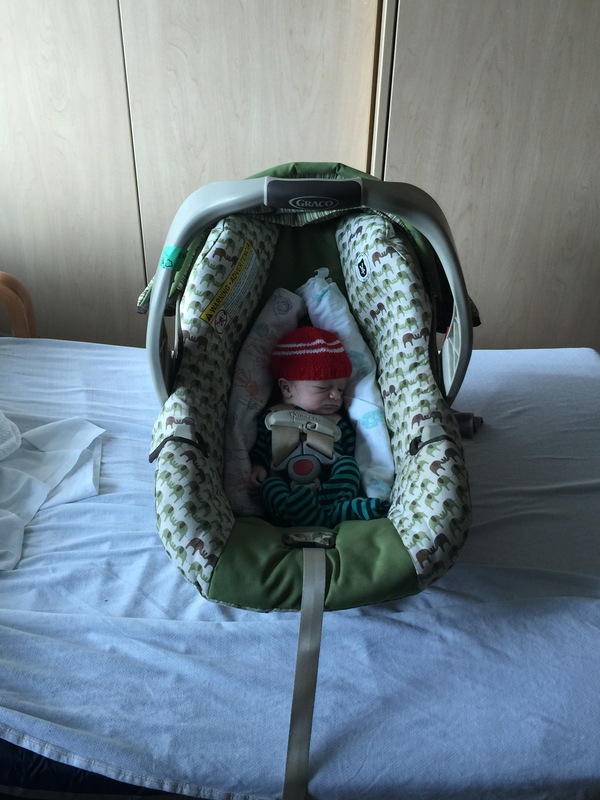 About 40 hours after arriving at the hospital, we got the all clear that we could go home. We couldn’t believe it; we were prepared for a lengthier stay. However, as it turns out, CJ’s birth parents were also from Oregon, so we were allowed to leave. Since he was born in Washington we figured we would have to wait it out, since the paperwork to cross state lines with an adopted baby can take a while. Apparently what really matters is where the birth parents are from. It all played out very conveniently in terms of timing. After such a hellacious, agonizing wait it was hard to believe the placement was truly so simple! Our nurse came in to help us with final details and asked us if we had any questions. It was so embarrassing, but we had to ask how to feed the straps back through the lowest setting on the infant seat. Three years was enough for us to have forgotten how to do it properly! And of course, we didn’t want to wing it and just hope for the best! She technically wasn’t allowed to touch the car seat but she did anyway. That hospital and all the staff were just amazing. We successfully secured our little nugget after much ado. Many couples find themselves in hospitals that aren’t adoption friendly, and they aren’t treated kindly by the staff. Our experience was the opposite; they did anything and everything they could to make us feel right at home and like we were part of something natural and really great. Perhaps because it was a Catholic hospital and they view adoption as a solution to abortion. That’s just my guess, but I think it’s a good one. When it was time to leave, we left our room with the Hubs toting our precious cargo in the infant car seat. As we entered the elevator a nurse joined us. She asked us if this was the baby born two days ago that was to be adopted. With big smiles, we told her he was and that we were the lucky parents. She started to choke up, and told us she was the first nurse that held CJ after his birth and did kangaroo care. She struggled to speak, finally saying, “He’s special. There’s something special about your baby.” Needless to say, we were pleased to hear this and touched at the nurse’s kind words. As we got off the elevator we felt like the luckiest people alive. Imagine finally having your dreams come true, and the circumstances surrounding them being next to perfect. I was overwhelmed with gratitude at how everything had unfolded. It seemed too good to be true, but somehow it wasn’t. Walking down the hospital corridors with our baby was a funny feeling. We both felt like someone was going to stop us and ask for proof that he was our son. No one did of course; people just smiled at us as we passed by. Less than two days before we had met this tiny, perfect creature, and now we were taking him home to be ours forever. Our son. It’s difficult to explain how hard it was to wrap our brains around all that had happened in 40 hours! As we pulled out of the parking garage and made our way to the freeway, it began to rain. I was driving at a crawl so as to protect my baby, but the increasingly torrential rains caused me and all the other drivers to slow almost to a stop. Less than five minutes after leaving the hospital, we were caught in the hardest rain we had ever experienced. It was still summertime! That kind of rain was highly irregular for early September, but there we were. When the rain finally let up and the sun shone brightly through the clouds, I took it as yet another sign that this perfect baby and this adoption were meant to be. God was doing his best to let us know He was with us on this journey! 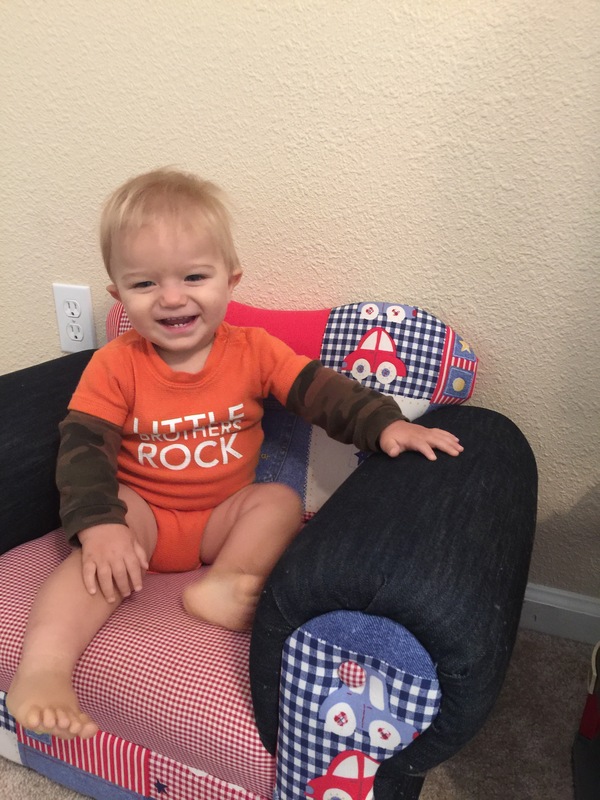 Here is a current picture of my little bruiser. Our 5.5lb baby is now 24lbs! Follow me on Facebook and at www.borrowedgenes.com. This is so awesome I cried! keep the story coming, how was it to bring him home!?!?! Please Don’t Stop! Thank you so much! I will write chapter six soon!